Lt. Gov. Jim Cawley listens as Chester County Emergency Services Director Ed Adkins talks about the county’s Emergency Operations Center, which has been at high alert all week, following this week’s ice storm that knocked out power to more than 200,000 county residents. WESTTOWN — The worst is over for most Chester County residents in the wake of this past week’s devastating ice storm, that left hundreds of thousands without power or heat, as Lt. Gov. 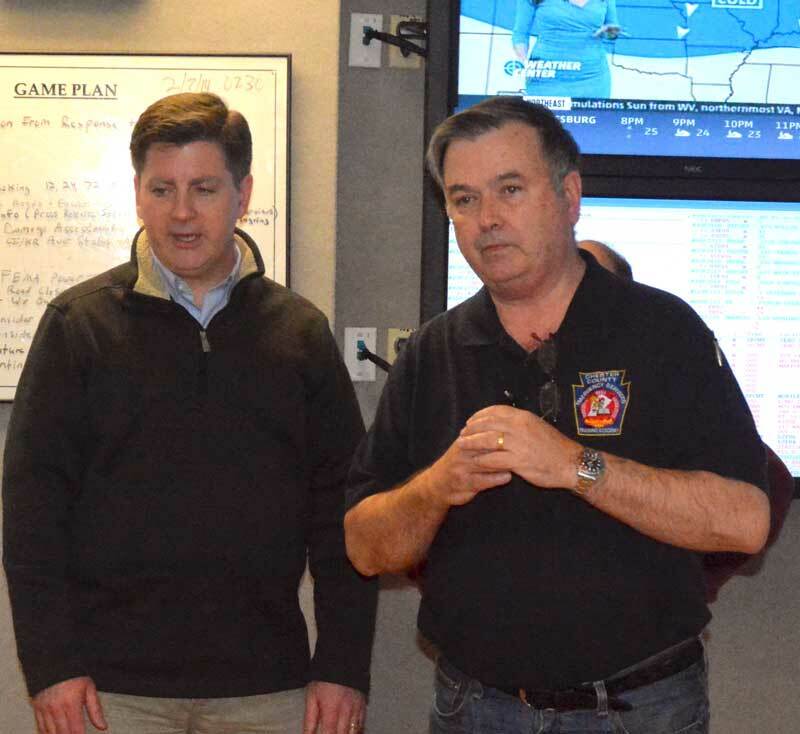 Jim Cawley came to the county to thank emergency workers and continue to offer the state’s support for recovery and restoration efforts, Saturday. 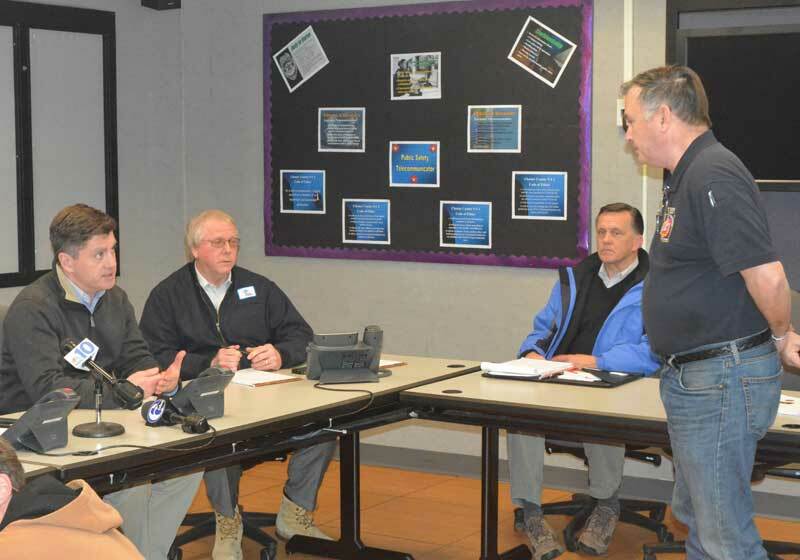 Cawley met with all three Chester County commissioners, county emergency services officials, officials from PECO and its parent company, Exelon, to bring all parties up to date as to what had been fixed and what work remained in the coming days. While there were widespread outages and property damage all over the county, the worst damage appears to have taken place in the northeastern portion of the county — where a number of homes were seriously damaged by falling trees and heavy limbs. According to PECO CEO and President Craig Adams, less than 56,000 locations — down from more than 200,000 – were without power as of Saturday afternoon. A total of 138,000 locations were without power in Southeast Pennsylvania. Adams said that the vast majority of remaining customers would see power back by Sunday night, and that for some 99% of the county, power will be back on by Tuesday at the latest. The exceptions would be a handful of locations in the county in isolated areas. Lt. Gov. Jim Cawley quizzes Chester County Director of Emergency Services Ed Atkins on the status of repairs, following this week’s ice storm. 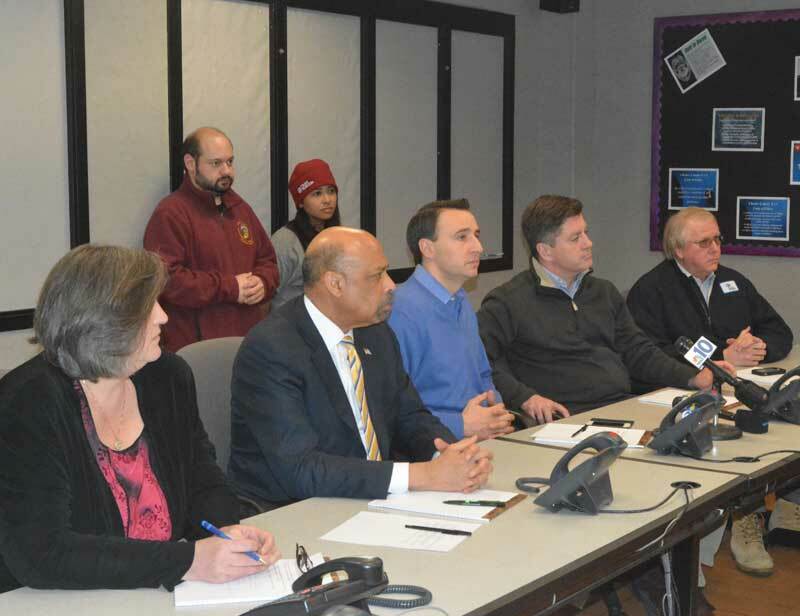 More than 200 roads around the county remain closed, said Chester County Board of Commissioners chairman Ryan Costello, down from 351 closed roads at the peak of the storm. Four of the county’s 911 towers and eight care centers remain running on generator power. Adams said the utility is prioritizing those locations as the restoration work continues. Although thousands continue to struggle with no power and no heat, local officials stressed some good news: no fatalities were reported from the storms and subsequent power outage. Some 25 cases of carbon monoxide poisoning were reported — many from using generators in enclosed areas, some from using charcoal grills indoors and one case where a frustrated resident placed a Duraflame artificial log on his kitchen table and lit it. In the latter case, no serious damage was reported to the home. Adams echoed comments that if a home gets too cold — rather than go to extreme measures — residents should find other, warmer options. “Make the commitment to shelter,” he said. And while work to finish the job of getting trees cleared and power lines up and running, already it appears come glitches occurred as PECO attempted to work with county officials. Chester County Commissioners (from left) Kathi Cozzone, Terence Farrel and Ryan Costello, Lt. Gov. Jim Cawley and PECO CEO and President Craig Adams listen to reports on the status of Chester County in wake of this week’s big storm. “If Craig and (PECO parent company Exelon Vice President Denis) Pete (O’Brien) had been here three days ago, we’d probably all be home by now,” said Chester County Department of Emergency Services Director Ed Adkins said. And while many residents had similar complaints about the company’s communication as the storm and resulting outage unfolded — a number of readers contacted The Times noting that repair estimates issued by the company were fluctuating, stating one date and time, then a later, then an earlier time and at times, no information — Adams said his company was working hard to communicate with local officials and customers, but this storm provided unique challenges. Still, he said, PECO will look for ways to improve, he said. County officials said that a number of challenges remain — beyond restoring power and other utilities and reopening closed roads, including a growing shortage of road salt in the region — a difficult winter season has used far more than usual, leaving it in short supply, and concerns about a possible heavy storm next weekend. Looking ahead, much work remains to more thoroughly repair power networks, many of which underwent “interim” repairs to restore service. Coupled with age of some of the power networks, PECO has work ahead of it in the coming months to increase durability of the network, Adams said. 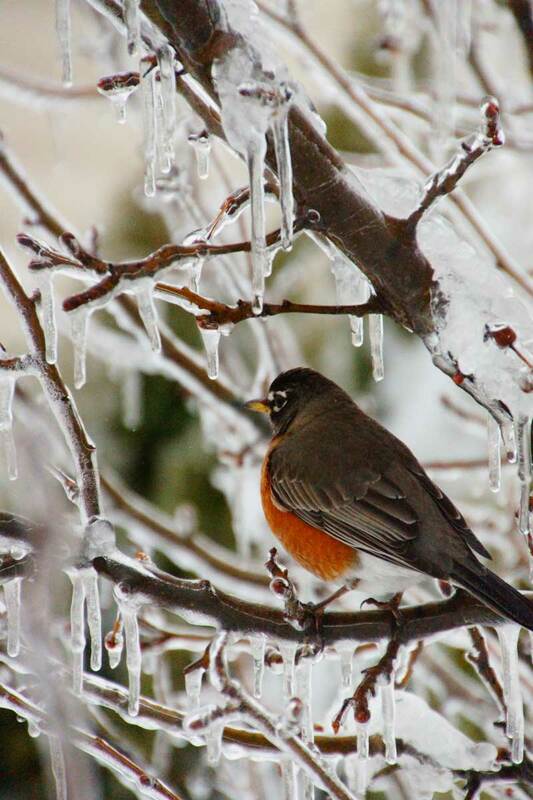 A bird is seen amidst ice-coated tree branches in Cochranville, earlier this week. Similar ice coatings caused trees and branches to shatter and damage utility lines throughout the county. Photo by Dave Lichter. Cawley, who toured the Emergency Services command center in the County’s Government Services Building, said there was a bit of good news from the storm: Gov. Tom Corbett’s transportation bill will help to rebuild some of the state’s aging infrastructure, helping to reduce the impact of such events in the future. Still, he said, that even with improvements, natural disasters can and will happen, meaning that readiness from state, county and municipal officials will always be paramount. “Mother nature has a way of reminding us who is in charge,” he said. Those still impacted by the storm now have a new information resource, by calling 211, they can get the latest information on how to get assistance from sheltering to finding power for their mobile devices.